UPDATE 1330 GMT: Claims are circulating that foreign-led regime forces have retaken al-Khalidiya, briefly captured by the rebel-Nusra offensive on Saturday. ORIGINAL ENTRY: Syria’s rebels and Jabhat al-Nusra pressed their offensive on the southern Aleppo front on Saturday, taking more territory from foreign-led regime forces. The pro-Assad troops, including Iranian units, were able to hold the villages of Zaytan and Birnah, but rebels and Nusra captured al-Khalidiya and continued attacks across a 10-km (6-mile) front, nearing the town of Khan Touman on the Aleppo-to-Damascus highway. Rebels and Nusra struck last Friday in a lightning offensive that reclaimed some of the territory captured by a regime-Iranian-Hezbollah ground assault, enabled by Russian airstrikes, from last October. Among the gains were the town of al-Eis on the highway. The jihadists of Jabhat al-Nusra are not part of rebel and opposition political blocs, but rebel factions co-ordinate operations with Nusra on the battlefield against the pro-Assad coalition, including Lebanon’s Hezbollah, Iraqi militia, and Afghan fighters as well as Iran’s Revolutionary Guards and special forces. Aleppo, Syria’s largest city, has been divided since July 2012. The Russian-backed regime offensive threatened last autumn to cut routes into the opposition-held areas of the city, but the attacks were unable to press limited gain before a February 27 cessation of hostilities. Citing continued attacks by the Syrian military on the ground and from the air, the rebels relaunched operations last week. Jabhat al-Nusra also renewed attacks in northern Latakia Province on Saturday, moving on Burj al-Bayda in the Turkmen Mountains. 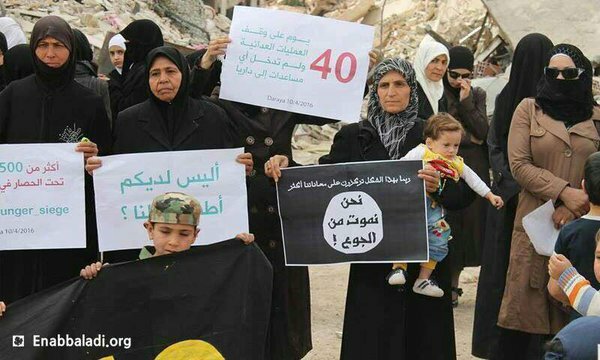 Last week, 47 women from Darayya wrote an open letter asking for help, as residents have been reduced to eating leaves to avert starvation. Darayya has been cut off by the Syrian military since 2012. The siege has recently been tightened by the regime’s occupation of the only road with nearby Moadamiya, and the UN has not been allowed to deliver food and medicine. Jaish al-Islam and other rebel factions have pushed back ISIS this week, including the capture of positions on the Damascus-to-Baghdad highway, in a three-sided fight in the area near the eastern Qalamoun mountains. While the rebels have advanced, the Syrian military has been holding off an Islamic State assault on the Dumayr military airport and the Tishreen power station near the city, 40 km (25 miles) from Damascus. Rebels have called for the evacuation of civilians from Sheikh Maqsoud in Aleppo city, amid fighting with the Kurdish militia YPG. The clashes surged last week. Rebels accused the YPG of trying to seize the al-Castello road, the main route into opposition-held parts of the city, while Kurdish activists and the YPG said rebel factions were firing mortars and rockets on civilian areas. The Kurdish outlets said 18 civilians were killed and scores wounded by the attacks. The rebel faction Jaish al-Islam said later that a commander were be put on trial for unauthorized use of mortars and Grad rockets on positions where civilians were present. The rebel statement on Saturday claimed the YPG were using the civilians as human shields and cited an “urgent need” to expel the militia. The rebels offered “secure evacuation”, with the promise of return to homes after the end of military operations.